People who study brilliance become brilliant. But what do the currents within some organizations want you to study? Failure. What’s not working. Why you aren’t making budget. Where you are making mistakes (and who’s to blame). Spare brilliant people the argument that you have to focus on your problems, lest you don’t understand them. The brilliant know that already. They understand the need for root-cause analysis. You can’t move forward in the direction you desire unless you leverage the past. What the brilliant also understand is that there’s a difference between focusing on failure – and becoming a student and victim of its malfunctioning sisters: loss of momentum, confidence, vision, and hope. Ask your team: What’s the difference between understanding our current problem vs. becoming a student of it? And, when is the right time to start moving forward? Brilliance, which is birthed by inspiration, doesn’t happen when we’re looking backwards. It happens when we are released from the emotions of lack, disappointment and insecurity – and the need to protect ourselves from others. It might be time for this conversation: We seem to thoroughly understand our problem. Let’s now move forward: Where do we have momentum in this area? What have we already achieved that gives us confidence we can succeed? Where are we brilliant – and how do we leverage that? We become what we study. 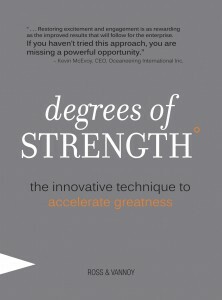 Read about some leaders who are studying brilliance in Degrees of Strength: The Innovative Technique to Accelerate Greatness. Improve Performance. Increase Responsibility and Accountability. Build Agile, Capable Teams….and do it with one quick read. Order Now to accelerate your greatness in 2012. Sign up for free to be part of our A-team and you’ll get free resources delivered straight to your inbox. Coming this month: Team Acceleration Guide. Click Here for access. Dear Craig and Steve, please elaborate on the following paragraph: “What the brilliant also understand is that there’s a difference between focusing on failure – and becoming a student and victim of its malfunctioning sisters: loss of momentum, confidence, vision, and hope.” I am a bit confused about what you meant by “a student and victim”.